My week is of course filling up with projects… the house needs to be deep cleaned, the garage organized, there are craft projects awaiting, yoga classes to plan… but first things first, today I decided to spend most of the afternoon frolicking in the sunshine. (I did a fair amount of yard work, actually). I decided that since my free time will soon be much more limited, I was allowed to savor the afternoon, sipping on pink wine, playing with the dog, and basking in the sunshine. Of course, at 7PM, after I had run a few errands, (and went over to my brother and sister-in-laws, to assist with some fruit tree pruning) I realized that the only thing I’ve consumed today is a bowl of cheerios, two cups of coffee, and two glasses of rosé. I’m a regular poster child for healthy eating habits over here… How does this even happen? I must have been really distracted by the sunshine, because typically if I don’t eat most of the day I get HANGRY (Angry out of hunger) and floppy, and irritated… All of these things hit me the second I walked out of the grocery store, but I think it is somewhat of a miracle that I’ve been able to last the day… Man cannot live on bread alone… but apparently this woman can survive on cereal and cheap wine? Once the Hanger pangs set in, I zipped home, and decided to whip together one of my favorite basic comfort-food casseroles. It is quite possible I have blogged about it before, but quite frankly, it deserves at least a few posts, because it is that awesome. I give you Snappy Tomatoes: Firstly, this dish is hilarious, and not one I would typically be drawn to. I like fresh, local, green dishes, and this is definitely not that. Not even close. 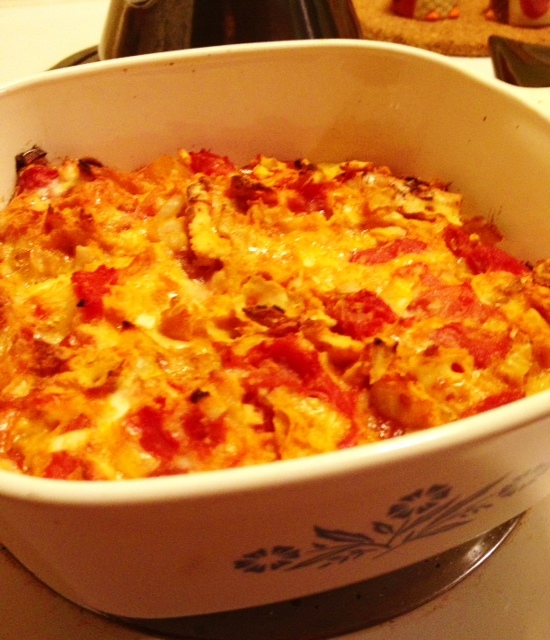 It more resembles tomato soup in casserole form, and though it isn’t green, or fresh (or healthy?) 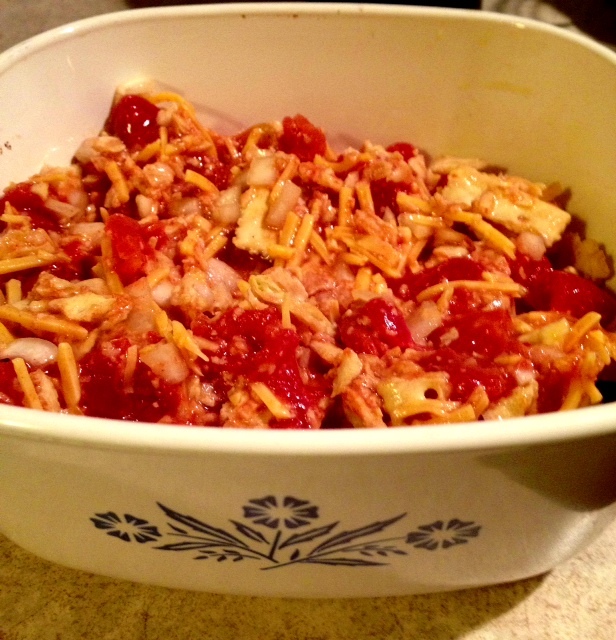 sometimes you just need a quick and easy casserole. 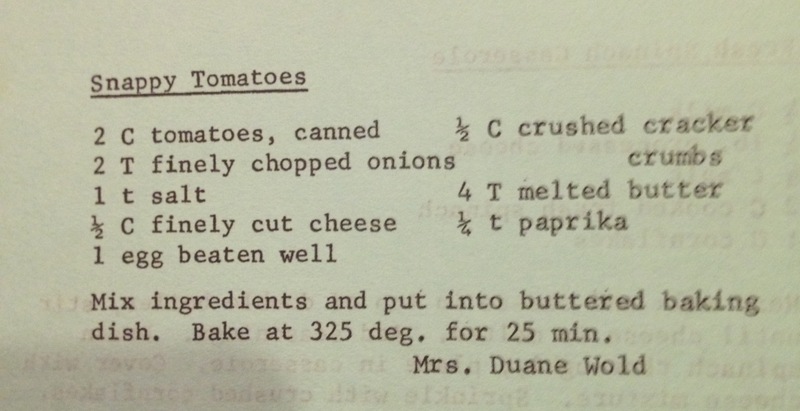 The recipe is my Grandmother’s and is published in her church cookbook from North Dakota… I really cannot say enough things about these recipes… Do people still make church cookbooks? 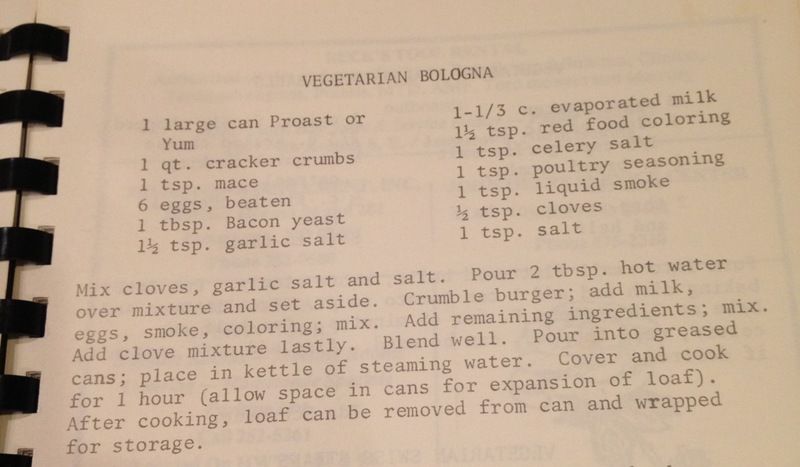 Are they still hand-typed, and filled with gems like “Vegetarian Bologna” (do we even want to know what might be in that? I stopped reading after bacon yeast.) I suppose these days we can just find recipes online, and rather than getting together with a group of ladies and comparing notes, and exchanging recipes, we just read each other’s blogs… but there is something undeniably charming about these old school recipe compilations. I always use more paprika, and more onion than called for in the recipe. I also substituted olive oil for butter, just because I was feeling extra hungry, and didn’t want to take the time to melt the butter. I used cheddar cheese this evening, but I think cottage cheese or even ricotta cheese would be pretty delicious… the recipe is quite basic, so it’s really easy to give it your own flair. The recipe makes just the right amount for 2-3 people (or yourself with leftovers… or not… depending on how Hangry you might be…) and is a perfect little dish for a Monday evening. Simple. Basic. And a little snappy. Haha…I’m glad we’re not the only ones who use the term Hangry! People still do, at least out here in ND, compile, sell and purchase new church cookbooks! They aren’t handtyped anymore as that would take too long, but you can pick them up at the grocery store and are frequently seen on the silent auction tables at benefits of one kind or another. In fact the first year D and I were together his mother gave me one such church cookbook as a Christmas Present. The older the cookbook though the more interesting to read. A co-worker recently brought her mothers Beta Cookbooks from, I believe, around late 1940 or the early 1950’s, into the office I work in and shared them with us. It was definately fun to read and see what was considered a great recipe! Most of my new recipes come from blogs and other online resources, but there will always be something fun about reading a good church cookbook.